With the Chinese New Year a month away, China Post issued a set of two special zodiac stamps on Saturday. 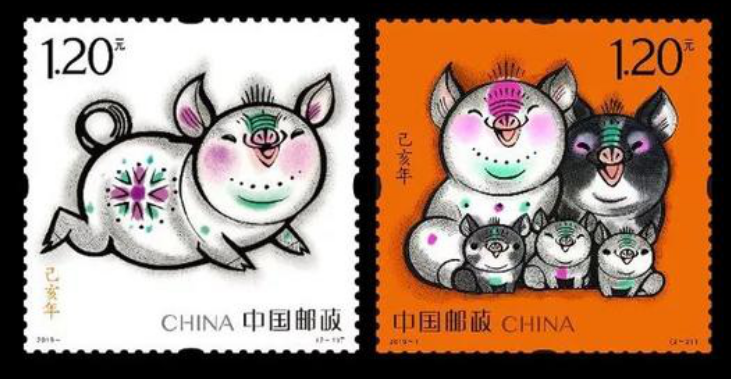 Featuring the pig for the incoming zodiac sign, each stamp is 1.2 yuan. Famous Chinese artist Han Meilin designed the set of stamps. Han was born in Jinan, Shandong Province in 1936. And he is most known for his "Fuwa" dolls made for the 2008 Summer Olympics in Beijing. The set comes with two different designs—the pig on the first stamp is simple and charming. It shows its vitality by running, symbolizing the beautiful and good life; the other stamp perfectly embodies the concept of "family", with two big pigs and three little ones appearing at the same time, expressing the best wishes for the family reunion in the New Year. On the edge of the stamp, the designer added some Chinese zodiac inscriptions in oracle bones to symbolize the long history of Chinese zodiac culture. Since 1980, China has issued zodiac stamps for 40 consecutive years. After 40 years of reform and opening-up, the collection of zodiac stamps has a special significance in recording the country’s changes. 1. How much is the set of stamps? 2. How old is Han Meilin now? 3. Which is TRUE about the third paragraph? A The set of stamps comes with two same designs. B The first stamp shows its vitality by sleeping. C The second stamp shows the concept of "family" with two big pigs and a little one. D The second stamp expresses the best wishes for the family reunion in the New Year. 4. What’s the Chinese meaning of the underlined word “symbolize”? A The Chinese New Year. B The Chinese Famous Artist. C A Set of Special Zodiac Stamps. D Chinese Reform and Opening-up.